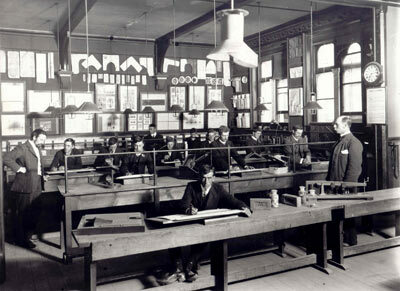 Additional courses offered in 1902 include: Carving in wood, stone and marble; Repoussé work in copper, brass, etc; House painting, decoration, sign writing, gilding, embossing, graining and marbling; Architecture and building construction, design and drawing; Practical woodwork; Cabinetmaking; Special classes for teachers and others; Wood and metal work; Paper, carton, and canework; Wood-carving; Brushwork; Modelling in clay or plasticene; Chalk and charcoal work on blackboard and paper. Students are able to sit for City and Guilds of London Institute [technology] examinations. A technical lending and reference library was opened at the school as a resource for the trade students. Charles Kidson is granted leave to travel to England and France where he gains experience in Arts & Crafts techniques including wood-carving, metal craft, modelling and plaster work, visiting Liberty's of London, and the Central School of Arts & Crafts, the South Kensington School, the Camden Town School of Art and his alma mater in Birmingham. In 1904, Kidson, with George Fraser, established a small art metalcraft business in Aylmer Street, Christchurch. In 1908 he sold a muffle furnace that he had been experimenting with for enamelling to the CCSA. New courses offered this year are tradesmith's geometry and pattern drawing, carpentry and joinery. Leonard Booth is appointed to staff (1903–33). Elizabeth Abbott (Kelly) is appointed to a part-time teaching position. New Zealand International Exhibition of Arts and Industries is held in Christchurch. Students from the School decorate one of the exhibition halls. The exhibition provides an opportunity to measure Canterbury artists' development with contemporaries beyond New Zealand: designs evolved from original sketches of flowers are sent by the South Kensington School for display. The International Exhibition also provides a direct stimulus for the arts and crafts tendencies that Robert Herdman-Smith introduces at Canterbury College School of Art, and for the local Arts & Crafts Guild he founds that year with ex-students from the School. Following his return from Europe in 1905, Sydney L. Thompson joins the staff as Life Master (1906–10). 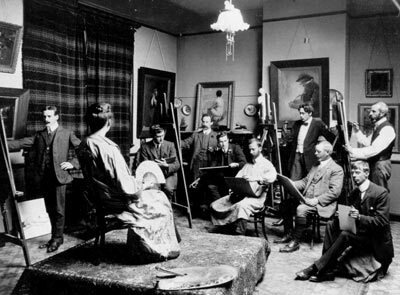 An Artists' Sketch Club is formed by Thompson and fellow artists including Cecil Kelly, Raymond McIntyre, Alfred Walsh, W. Menzies Gibb, Leonard Booth, Edwin Bartley, Kennaway Henderson, and Charles Bickerton. They meet regularly at Thompson's studio at 97 Cambridge Terrace, Christchurch. Junior Free Day Students are admitted for the first time, under a Government scheme offering students two years' free education as juniors and a further three years as seniors. 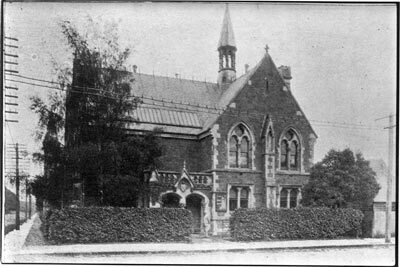 Between 1907 and 1945 an estimated 2000-3000 junior students would attend the School, including Evelyn Polson (later Page) in 1915. Assisted by Raymond McIntyre, Cecil F. Kelly is taken on to teach elementary art to the first intake of Junior pupils. The following year, he also offers instruction in photographic retouching. Other appointments to the staff in 1907 include carver Frederick Gurnsey (1907–23), Art Needlework Tutor Mrs J.A. (Sidney) Mayne; Cecil F. Kelly (1907–1945) and R.W. Webster (1907–1921). Frederick Gurnsey had trained at the Central School of Arts & Crafts in London and the School of Applied Art in Edinburgh, and also tutored at the Norwich School of Art. He taught carving, modelling, casting, enamelling and metalwork. (Ann Calhoun, Simplicity and Splendour, p.36.) In the wake of the 1906–07 exhibition, art and design students favoured art jewellery and enamelling, tutored by Gurnsey (and after 1917 by Ann Buckhurst). The School has nine instructors in pure and applied art by this time, and offers the following local Examinations and certificates: Elementary drawing certificate, Art Teacher's diploma, Architectural diploma, and Art Craftsman's diploma. Quantity surveying is offered as a new course. Director of the School Robert Herdman Smith travels overseas to visit the leading English provincial art schools, as well as art schools in France, Germany, Belgium and Holland. 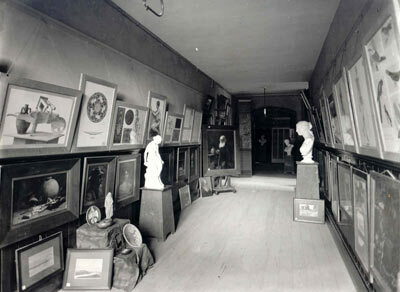 He also purchases a number of works of art for the art school collection. Numbers of students enrolled at the school grow to crowded levels. From the left standing: Samuel Hurst Seager, Charles Kidson. 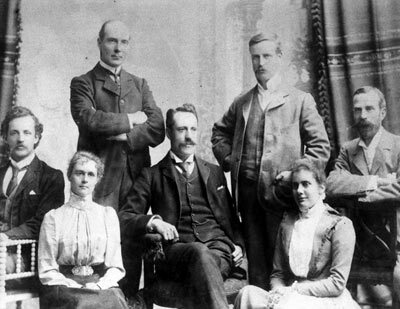 From the left seated: George W. Bradley, Miss H.L. Smith, George Herbert Elliot (headmaster), Miss Helen F. Gibson, Alfred Walsh. "The years between 1900 and 1949 were largely dominated by two generations of Canterbury artists and witnessed the rise of Canterbury art to a place of pre-eminence, which set the scene for a new order in the visual arts [in New Zealand]. But this would also incite a shift in attitudes in the years that followed, thus diminishing the position that Canterbury art once held. In 1900 Canterbury art was still on the brink of change with the first generation of artists to emerge from Canterbury College School of Art beginning to find a place in the art community." 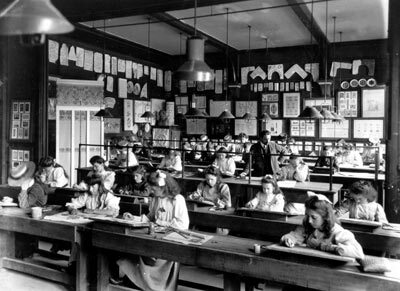 The School's syllabus for 1907 stated that students enrolled in the 'Design and Artistic Crafts Course' must provide themselves with 'drawing paper (best quality cartridge), drawing pins, rubber, 6 in. 60 [degree] and 6 in. 45 [degree] set squares, 12" scale, protractor, pencil, compass, dividers, and imperial T square.' Plane Geometry, Solid Geometry, Perspective, and Applied Geometry make up the course content. 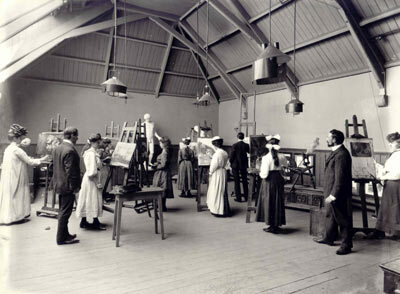 A painting class held in the Life Drawing room, now known as the Francis Shurrock Studio. 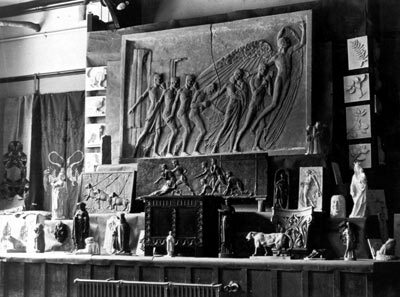 One of the classical plaster models sent out from the South Kensington School of Art is visible at the far end of the room. Group of men painting a woman with a fan. L-R: Cecil Kelly. L. H. Booth,E. Bartley, A. K. Henderson, Sydney Lough Thompson (showing a 'stylish technique'), Raymond McIntyre, W. Menzies Gibb, Alfred Wilson Walsh, Charles Bickerton. A version of the Sketch Club was still operating atthe School of Fine Arts in the mid-1990s, as a social club for the artstudents. 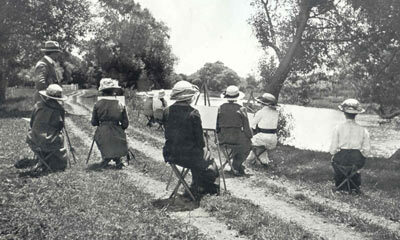 An outdoor sketching class on the Avon riverbank, near the Helmores Lane Bridge, Hagley Park. The students would have walked across the Park from the School of Art, carrying lightweight portable easels.